Gaétan Joseph Pierre Duchesne was born on July 11, 1962, in Quebec City, Quebec. The Capitals drafted him in the eighth-round (152nd overall) of the 1981 NHL Entry Draft. 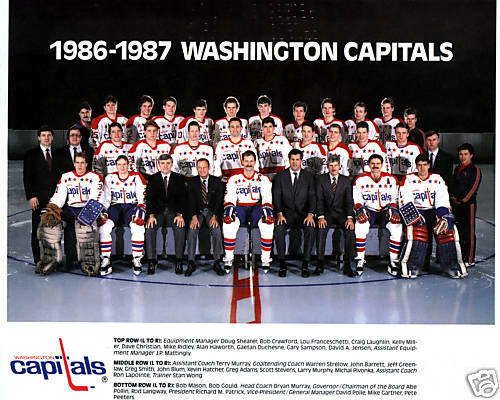 In this newest Capitals Alumni Profile, NoVa Caps’ writer Diane Doyle looks back on his hockey career and some of the highlights of his playing days in a Caps uniform. Prior to playing with the Caps in the NHL, Duchesne played two full seasons with the Quebec Remparts in the Quebec Major Junior Hockey League (QMJHL). During his second year with the Remparts he scored 27 goals and added 45 assists for 72 points. He also chipped in a goal and six assists in seven playoff games that year. After the draft, he returned to the Remparts for two more games, but he spent most of the season following the draft with the Caps. During his rookie year (1981-82) he played 74 games, scoring nine goals and contributing 14 assists for 23 points. The next year he improved to 17 goals and 19 assists for 37 points in 77 games played. He posted double-digit totals in goals and exceeded 35 points for the remaining years of his career with the Caps. In both the 1983-1984 and 1986-1987 seasons he scored 17 goals. His career-high in points came during the 1986-1987 season, when he had 52 points. That was the year he recorded the highest assist total of 35. He also contributed during the playoffs, scoring four goals during the 1986 postseason and three goals during the 1987 postseason. He had three assists during the 1986 Stanley Cup Playoffs. The Caps traded Duchesne, along with fellow forward Alan Haworth, and a first-round draft pick to the Quebec Nordiques on the day of the 1987 NHL Entry Draft for center Dale Hunter and goaltender Clint Malarchuk. One of the primary reasons for the trade was the fact that Capitals goalie Bob Mason would not be returning to the team the following season. After the trade, then-General Manager David Poile said he was “…as honest as the day is long as far as his work ethic and I was reluctant to give that up.” He ended his six-year tenure with the Caps with 87 goals, 138 assists, and 225 points in 451 games played. In his first season with the Nordiques (1987-1988), Duchesne had a career-high in goals, potting 28; however, he never reached that total again. He played one more season (1988-1989) with the Nordiques before playing four seasons (1989-1993) with the Minnesota North Stars. He was an important part of the North Stars team that made it to the Stanley Cup Finals in 1991. After that, he spent one full season with the San Jose Sharks (1993-1994). The following season he was traded to the Florida Panthers which would be the final team of his career. He finished his career having played 1,028 NHL games, scoring 179 goals and adding 254 assists for 433 total points. He became an assistant coach under Head Coach Jean Provonost, for the Quebec Rafales of the International League during the 1996-1997 season ,after the team had relocated from Atlanta. He also played for the Rafales that season, scoring 10 goals and adding 18 assists. He played just three games for the team in 1997-1998 and ended his professional career as a player for good. He was also an assistant coach for his former junior hockey team, the Quebec Remparts. Starting in 2008, the Caps held an intra-squad tournament during the preseason, with the winner of that tournament earning the Gaetan Duchesne Cup. They held the game every year until 2011, when they started playing more preseason games instead. This entry was posted in History, News, NHL, Players and tagged 1981 NHL Draft, Capitals Alumni Profile, Diane Doyle, Florida Panthers, Gaétan Duchesne, Minnesota North Stars, QMJHL, Quebec Major Junior Hockey League, Quebec Nordiques, Quebec Remparts, Washington Capitals. Bookmark the permalink.